Figure 1a - Transverse view of an earthworm segment (click to enlarge). Figure 1b - Anterior part of an earthworm (click to enlarge). The sub-order Lumbricina belongs to the phylum Annelida, Class Clitellata and order Haplotaxida. It is considered that this sub-order consists of the so-called "true earthworms". To its part, the family Haplotaxidae, sub-order Haplotaxina, is considered to be phylogenetically a basal group in regard to the classical terrestrial earthworms. In 1758, Carl Linnaeus described the very first earthworm species, Lumbricus terrestris. In 1826, Savigny showed that earthworms were in fact composed of several species. Today, 23 families have been described and more than 5300 valid species are recognized. Since taxonomical descriptions began, the classification of earthworms has undergone regular changes, recently including the removal of the family Octochaetidae, the reinstatement of the Rhinodrilidae family (James, 2012) described by Benham in 1890, and the addition of a new family: Tritogeniidae (Plisko, 2013). Many groups, in particular in temperate areas, contain cryptic species, including genus common in Europe and North America (Lumbricus, Eisenia or Aporrectodea), and for some of them, specialists speak more about species-complexes. However, recent development of molecular technologies, such as New Generation Sequencing (NGS) and DNA barcoding (Huang et al., 2007; Decaëns et al., 2013), may considerably help the conventional morphological taxonomy and the understanding of the phylogenetic relationships in earthworms. Distribution: Earthworms are distributed in a very large range of soil types and climates. The main limiting factors to their survival are the temperature and water content of the soil. Thus, they can be found everywhere except dry lands and deserts, and polar areas. Their diversity is by far more important in the tropics, becoming spectacular in tropical rainforests, than in temperate and boreal countries. In this latest, such as in Siberia, only few species can survive via specific adaptations. 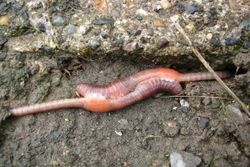 Figure 2 - Earthworm bisexual reproduction. Earthworms are triploblastic animals. In other terms, the blastula or earliest stage of embryonic development contains three primary germ layers: The ectoderm, mesoderm, and endoderm. They belong to the basal group of Protostome Lophotrochozoa, which they share with the other annelids, molluscans, nemerteans (ribbon worms), platyhelminths (flatworms) and rotifers. 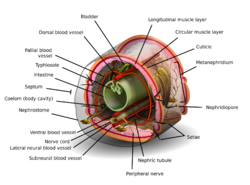 The nervous cord is ventral and the intestinal region occupies 80% or more of the body length (figure 1). The body wall musculature is divided in 2 tissue types: the longitudinal musculature (striated tissue) and the circular musculature (smooth tissue), which allow body extension and peristaltic movement. They often possess several pairs of hearts and from 2 to several tens of excretory systems (nephridies) per segment, in particular in tropical species, in which symbiotic bacteria have been recently discovered (James and Davidson, 2012). Reproduction: Most earthworm species have a bisexual reproduction mode, few of them being exclusive or non-exclusive parthenogenetics (i.e. Eiseniella tetraedra or Pontoscolex corethrurus). The copulation is carried out head to toe (figure 2) when male organs are well developped. Spermatozoids are transferred to the partner and stored in spermatecae until the maturation of female organs. Then occurs the fecondation. Physiology: The immune system is particularly well developed in earthworms and immune cells are found in the coelomic liquid, in the space surrounding the digestive tract and limited by the body wall (Cooper and Roch, 2003). In the earthworm digestive tract, like a large number of invertebrates, there exists parasitic gregarines (unicellular apicomplexans) (Omoto and Cartwright, 2003). 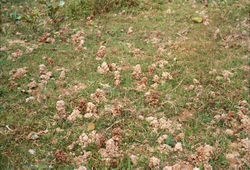 Figure 3 - Pasture in India with earthworm casts. Lumbricina species are found in a large range of habitats, from costal marine environments (i.e. Pontodrilus littoralis) to freshwaters (i.e. members of the Almidae family) and soils. However, most species are terrestrial, some of them living in mud or very wet soils. Haplotaxina species are mainly subservient to freshwater biota, including sediments. Density and biomass of earthworms can be very high in temperate and tropical pastures, exceeding sometimes several hundreds of individuals per square metre (figure 3). Functional ecology: In a soil, the microfauna is composed by microscopic animals (<0.2mm), including nematodes, small arthropods and protists (i.e. protozoans) (Lavelle and Spain 2002). This fauna, together with the soil bacteria and fungi, is very active as organic matter decomposers. The mesofauna, between 0.2 and 1mm, includes mainly nematodes, acarians, rotifers and collembolas. This animal guild fractionates large particles of organic matter and greatly facilitates the decomposition activity of the microorganisms. The macrofauna, the most visible fringe of the soil fauna, is mainly composed and massively dominated by earthworms and large arthropods (Lavelle and Spain 2002; Edwards, 2004). This animal fraction is the motor of soil bioturbation, contributing to air, water and organic matter circulation within soil layers, and fragmentation of the soil litter. The gallery network of earthworms helps the penetration of the root system at depth and the drainage of soil. Earthworms are also a key factor in soil nutrient cycling. Habitat disturbance and species invasion: With increasing human migration around the world, there is greater risk of the spread of invasive species to other regions, which can impact on soil biodiversity. Soil fauna and earthworm diversity are also affected by habitat disturbance, such as deforestation. The functional equilibrium between species is disturbed in such events, with trends showing more loss of anecic and endogeic species to the benefit of epigeics as disturbance intensifies (Lavelle, 1997). Ecotoxicology: Earthworms constitute a biological model today widely used, as to assess the impact of contaminations on the environment than to understand potential toxicological effects of a contact with some industrial chemicals. Thus, pesticides, metals, polycyclic aromatic hydrocarbons (PAH), and more recently nanoparticles, are among the most studied contaminants. Most of the time a pollution has negative effects on earthworm communities, depending on the intensity and the acute or chronic character of the contamination. However, high capacities of resistance and detoxification have been reported (Stürzenbaum et al., 2004), some species developing a tolerance to toxic elements (Piearce et al., 2012). Savigny, in 1826, highlighted that earthworms are constituted in several species.